ALL ABOARD! It's The 1st Annual Classical FM Summer Cruise. 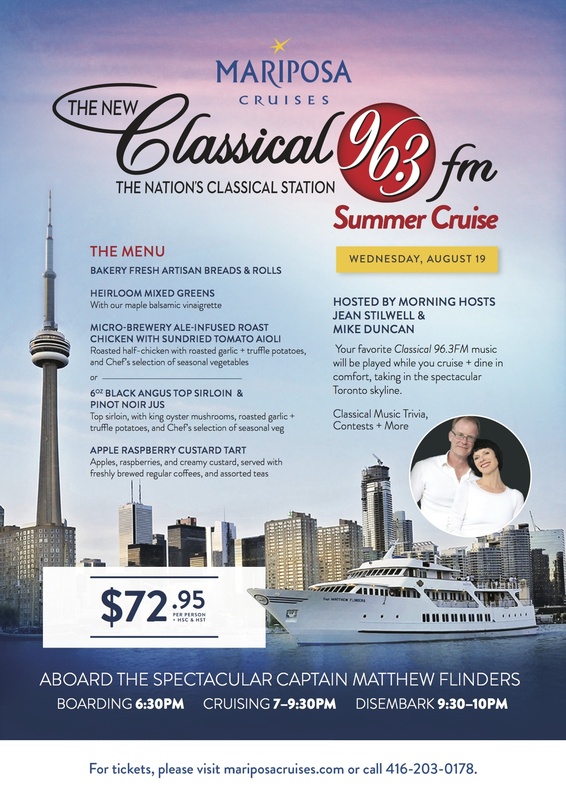 Join The New Classical FM’s Morning Show hosts Mike Duncan and Jean Stilwell as they host Mariposa Cruises’ 1st Annual Classical FM Summer Cruise on Wednesday August 19 aboard “The Captain Matthew Flinders”. The cruise leaves from the docks of Harbourfront at Queens Quay Terminal at 7 pm and your 2 ½ hour Dinner Cruise includes a 3-course gourmet dinner, your favourite Classical FM music, Classical Music Trivia, contests, and breathtaking views of Toronto’s skyline. Tickets are just $72.95 and include the delicious dinner and cruise. Order your tickets today! Call (416) 203-0178 or go to mariposacruises.com.